Do you experience back, neck, or shoulder pain while sewing? The first and most important step toward good ergonomic sewing is the right chair! I recently quilted a large quilt and I was in my chair for hours on end with the back locked in a forward position as you recommend. In the past, my back, shoulders and neck would have been sore at the end of a quilting day, but with my new chair I felt GREAT. No stiffness or soreness at all. I am so happy I made the investment! 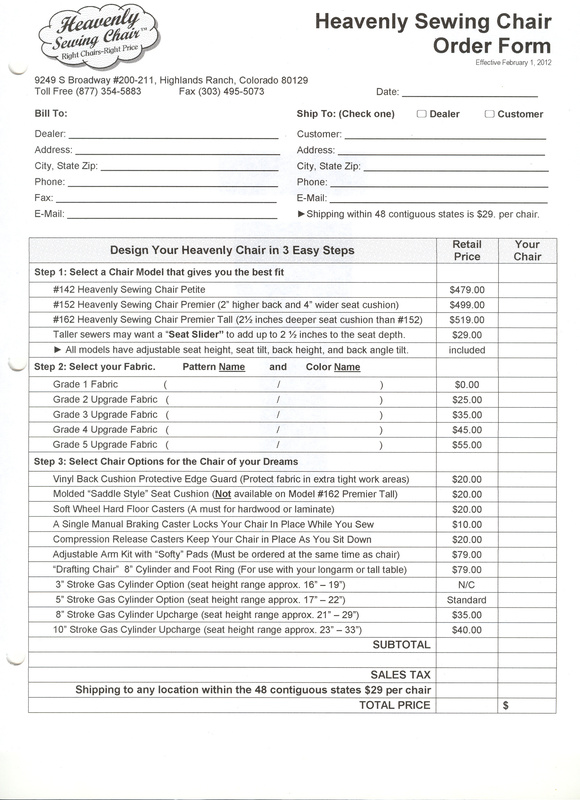 The Heavenly Sewing chair comes standard with all the adjustments you need to set the chair to your body including a built in lumbar support. No office chair on the market can match this chair for supporting your back in sewing posture. Office chairs do not come forward far enough to touch your back when you are leaning forward to sew. This chair will support you in all the right places and greatly reduce fatigue while sewing. Your chair is made custom for you with your chosen fabric, click on these photos to pick your favorite! Order your Ergonomic chair now and you can be comfortable with your back fully supported while sitting in sewing position. No office chair will be able to adjust the way this chair does!!! Overall Height: 31" - 38"
Seat Cushion Width: 18 1/2"
Overall Height: 32" - 39"
Seat Cushion Width: 21" Wider seat pan! Seat Height range: 17" - 22"
Back Cushion Width: 20" Wider back Cushion! Back Cushion Height: 18" Taller back cushion! Seat Cushion Depth: 21" Deeper Seat Pan! I will apply the available discount and applicable sales tax at the time of your order.